Years ago, whenever my grandmother would come home to the Philippines, she’d tell me about how foreigners would complain whenever a Pinoy would cook tuyo (dried herring). Even my young cousins, born and raised overseas, would complain about the stinky fish she was cooking. First time I heard it, it came as a surprise to me. For me, smelling the distinct smell of frying tuyo was enough to whet my appetite. The thought of tuyo eaten with steaming rice and a large helping of diced tomatoes was, and still is, heaven for me. So you can just imagine how happy this particular lunch made me, yes? Loads of marinated tuyo fillets, diced tomatoes and some salted egg to go with the tomatoes. And rice of course. This lunch calls for loads of rice. Can’t get more Pinoy than this. Whether it’s the tuyo you buy from the wet market, to be fried before eating, or the bottled, seasoned kind like the one pictured here, it’s still sheer happiness. Isn’t it amazing how a cheap, paltry fish like this evoke feelings of joy and satisfaction? This may be a cheap thrill, but this ranks up there with my favorite restaurants when it comes to satisfaction delivered. What about you? What are your cheap thrills? 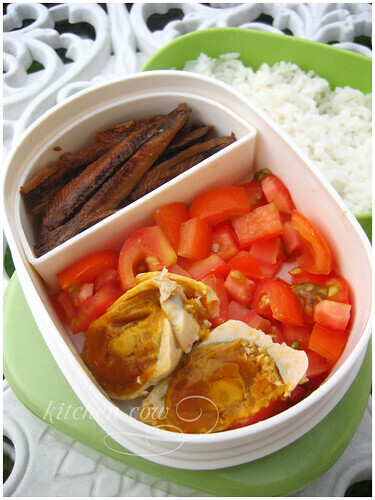 This entry was posted in bento, food spotlight and tagged appetite, baon, bento, diced tomatoes, grandmother, heaven, herrings, itlog na maalat, packed lunch, philippines, salted egg, stinky fish, surprise, tuyo. Bookmark the permalink. My #1 cheap thrill is spaghetti all’arrabiata, spaghetti in hot tomato sauce. It doesn’t get more basic than this and it never fails to make me at home. The ultimate comfort food. Sadly not that great for a bento… pasta should be fresh! The Tuyo sounds interesting. I’d like to try it… and the salted eggs! Fishball and isaw makes me happy. My mother doesn’t like us eating street food, so each stick brings some sort of forbidden pleasure. I’m not much of a fish eater, but I loooove fried galunggong, specially when it’s made into sinigang. Yum! Mmmm… a cheap thrill for me is a newly-opened container of vanilla yogurt on a hot day. *dreamy sigh* It’s so delicately flavored but tangy, so invigorating… I dance whenever I dig my spoon into a container that I am the first one to open. And then I eat it just by itself, savoring the consistency and texture and how it’s so lovely and custardy and just divine…. All of this from fat-free vanilla yogurt. XD I don’t need ice cream if I have yogurt. Reminds me of my childhood love of baked beans… the kind from a tin. I used only eat rice with sauce, so the nights where my mom cooked dishes without sauce, she would open up a tin of baked beans for me to mix with my rice. Oooh I have a craving now! You’re bawal to make tusok tusok the fishballs? Teka teka, fried galunggong na SINIGANG? Uy gusto ko masubukan yan, feed me nina! Darn it, now I want some Mango Frozen Yogurt because of all of this yogurt talk from you! *sigh* I probably have to rush to the convenience store across the street after writing out this reply. Do they sell it in Australia? I have quite a few cheap thrills, because we had it rough growing up. For me, a fresh pitcher of icy koolaid in the summer, saltine crackers with mustard sardines on them, vienna sausages right out of the can, and the first cobs of sweetcorn from my grandfather’s garden, are sweet sweet memories for me.